For most kids, the highlight of a family vacation is the swimming pool. Whether you’re camping or set up in a five-star hotel, at the end of the day, water can bring together the most bickering siblings and road-weary parents. That said, one thing I’ve learned as I come to the end of my 30’s is a disdain for really cold water. Let my kids’ lips turn blue, but these old bones need lukewarm or above. As we’ve rambled around the Western United States the past few years, we’ve sought out swimming pools heated by Mother Earth. 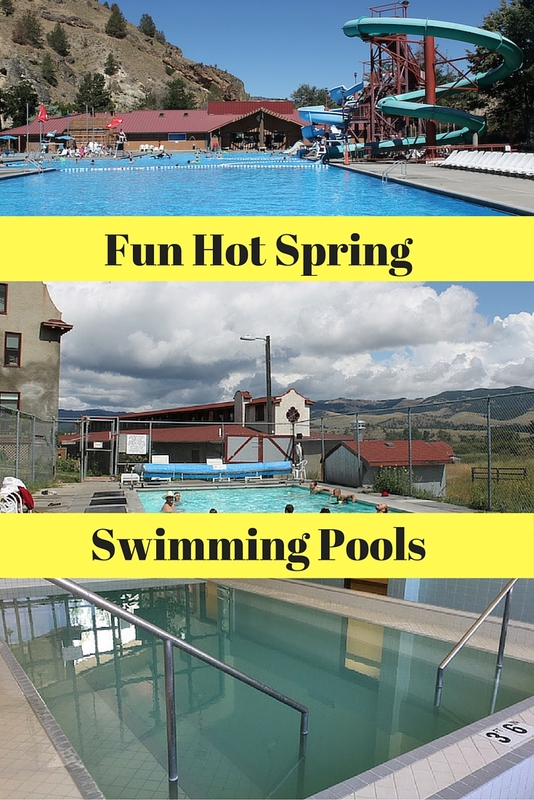 From Evan’s Plunge in Hot Springs, South Dakota to the Glenwood Hot Springs Pool in Glenwood, Colorado (book your stay here), chances are you’ll find a comfortably warm place to swim in any region formed by volcanoes and known for geothermal activity. Here are five hot springs swimming pools we’ve visited in the last few years. Located on the McKenzie River in the heart of the Cascades Mountain Range, Belknap Hot Springs features two mineral swimming pools. 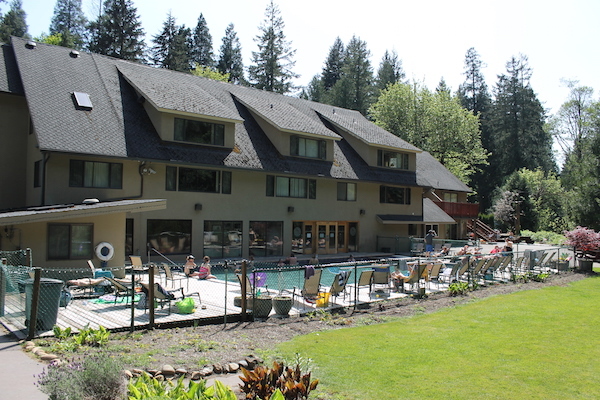 Guests of the lodge have access to both pools, the larger of the two is behind the main lodge building and the smaller pool is up the hill in the campground area. Unregistered guests can swim at the lodge pool with a day pass (we did this). Don’t leave without a walk through the extensive gardens, including the beautiful secret garden. Read more in this story. A year-round favorite for visitors to greater Fairbanks, Chena Hot Springs is worth the drive from the city. 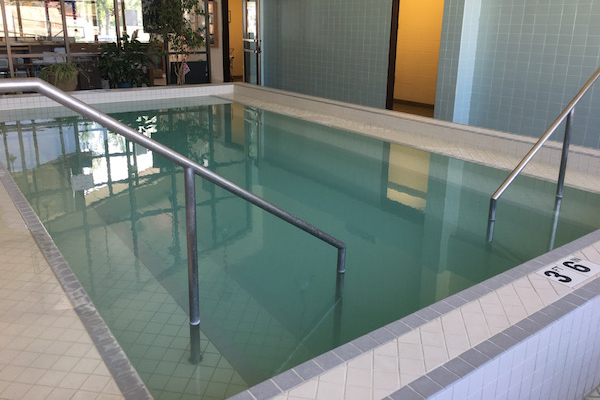 We visited in December and enjoyed the warm waters of the indoor family pool (guests eighteen and older are allowed in Lake Chena, a massive outdoor hot spring pool). Because this destination is nearly free from light pollution, it’s an excellent place to look for the Northern Lights. Read more about what to do in Fairbanks in the winter in this story. 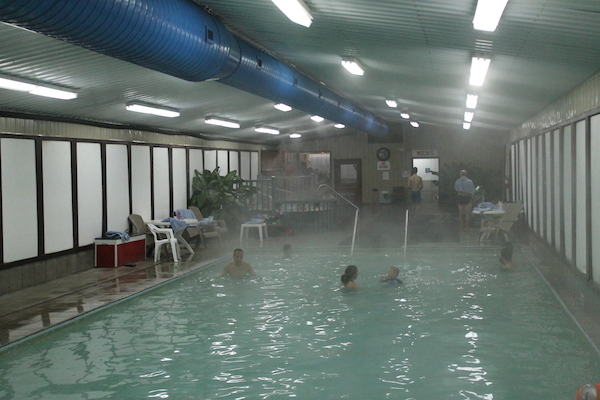 Like Belknap Hot Springs, Boulder Hot Springs is available to guest and day visitors. 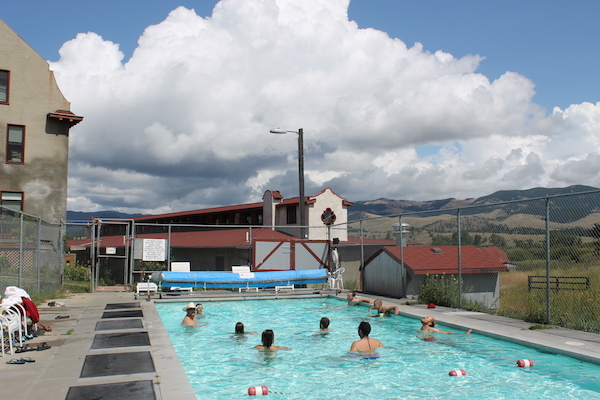 From the outdoor pool, guests experience panoramic views of the Helena National Forest and understand how the state earned a reputation for having big skies. Guests can also enjoy indoor amenities—steam rooms, spas, and a cold plunge—in the gender-specific locker rooms. Soft serve ice cream is available from the main desk; towels and bathing suits are available to rent. Read more about what to do in Helena in this story. Housed within Hot Springs State Park in Thermopolis, Wyoming, the State Bath house is a free and popular attraction linked to the world’s largest mineral hot springs. The facility features indoor and outdoor pools, with the outdoor pool partially shaded from the sun and rain. I felt completely relaxed after visiting Hot Springs State Park, but noticed my bathing suit took home a bit of a permanent mineral odor as a permanent souvenir (bring your grubby suit if you have one). Towels are available for rent at the front desk. Read more in this story. 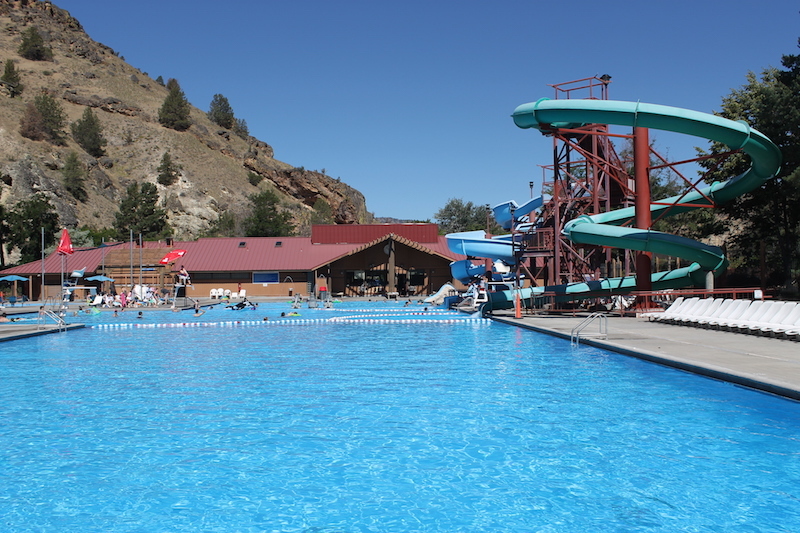 The main attraction on the Warm Springs Indian Reservation in Central Oregon’s high plains region, Kah-Nee-Ta Resort & Spa features a double-Olympic size hot springs swimming pool. The largest hot springs swimming pool we’ve frequented so far, the swim is worth the drive. Resort guests and day trippers can enjoy the pool, which is divided into different regions (based on depth) and features two water slides. Read more in this story. Update — unfortunately, as of August 2018 Kah-Nee-Ta has closed. 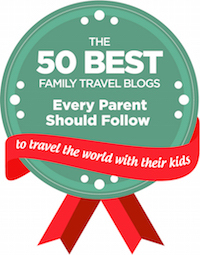 Do you have a favorite family-friendly hot spring swimming pool? Leave a comment below. 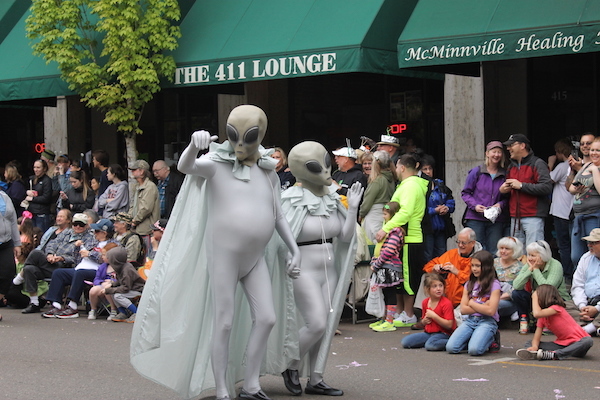 Julie Henning is a freelance writer and journalist based out of Eugene, Oregon. She is a member of the Society of American Travel Writers and owner of the family-travel website RoadTripsForFamilies.com. She is a recent past member of the Midwest Travel Writers Association and the Association for Great Lakes Outdoor Writers. 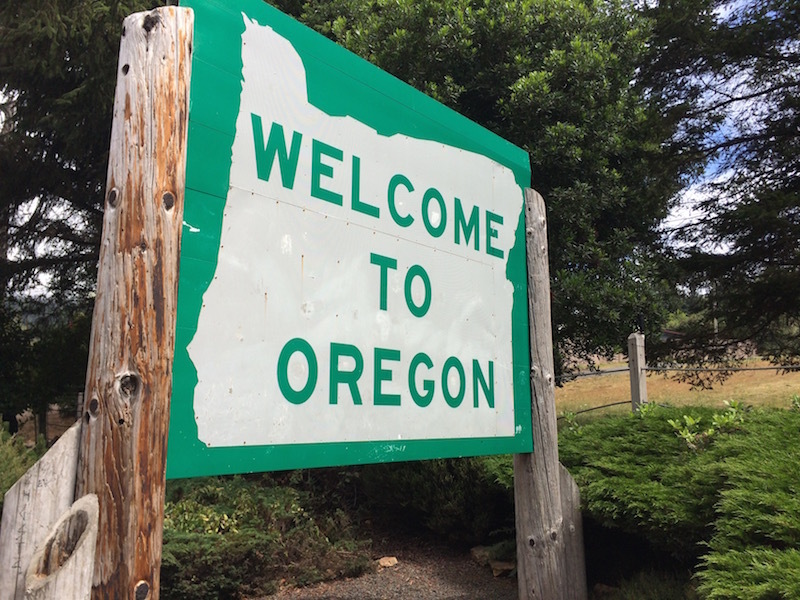 Julie is the Oregon Coast destination specialist for Bindu Media, an itinerary-focused website launching in Spring 2016 and featuring the work of 200+ professional, indie travel writers. Julie has been published in the Milwaukee Journal Sentinel, the Wisconsin State Journal, The Daily Journal (Kankakee, Illinois), the Rochester Post Bulletin, Wisconsin Natural Resources (DNR) Magazine, Sustainable Chicago Magazine, Group Tour Magazine, Student Group Tour Magazine, Silent Sports Magazine, Intercom Magazine, Roadtrippers.com, and FTF Geocacher Magazine. Julie has appeared on Wisconsin Public Radio, Ohio Public Radio, and KCBX FM Central Coast Radio and is an affiliate producer with the Journeys of Discovery with Tom Wilmer, a National Public Radio travel podcast. She has blogged for TravelWisconsin.com, Travel Oregon, and VISIT Milwaukee. Julie travels with her three kids and black lab as much as possible and lives by the motto, "Not all who wander are lost." Check out some of her best work at www.juliehenning.com. Great Ontario Road Trips: JustFly Tells You Their Favourites! Trying to Plan a Trip to Bali? Consider These Helpful Tips! 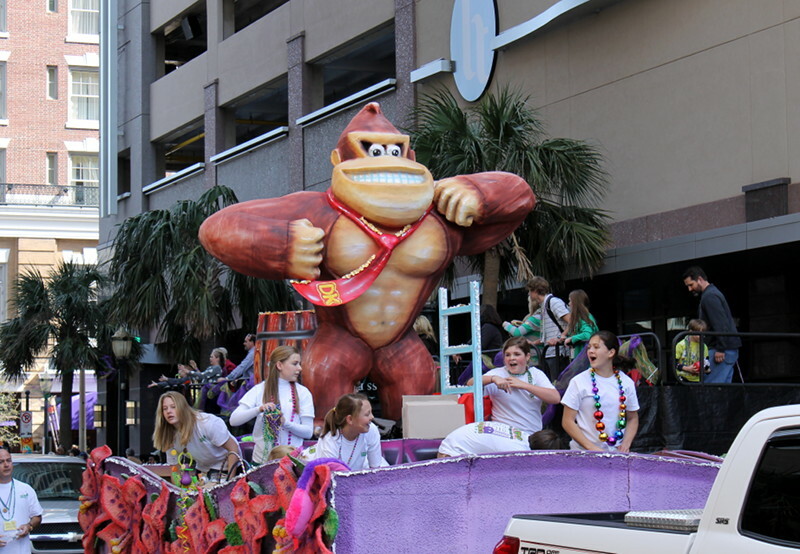 RoadTripsForFamilies.com participates in affiliate programs. Please see our Disclosure page for more information. © Copyright 2019. Road Trips for Families. Theme by BloomPixel.